When you’re starting a business it’s easy to get caught up in the passion and excitement of selling something you love. Before you rush into anything, I want you to take the time to reflect on these 9 questions. These are the same questions I ask all of my clients and it’s the reason I am able to get a logo concept we move forward with the first time. To help you out even more, I have a worksheet for you that you can download and write in your answers. 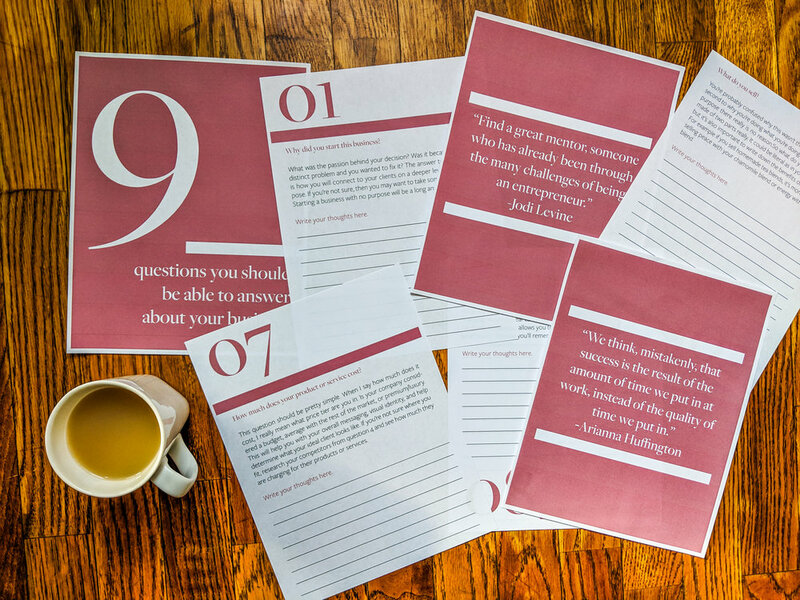 You can subscribe here to get the printable workbook! When I did this for myself, I went to a local coffee shop, put in my headphones and took a couple hours to reflect. Let’s get started. What was the passion behind your decision? Was it because you saw a distinct problem and you wanted to fix it? The answer to this question is how you will connect to your clients on a deeper level. It’s your purpose. If you’re not sure, then you may want to take some time to reflect. Starting a business with no purpose will be a long and tough road. You’re probably confused why this wasn’t the first question. This comes second to why you’re doing what you’re doing. Like I said above, without purpose there really is no reason.So what do you sell. This question is made of two parts really. It could be literal as in your product or service, but it’s also important to write down the benefits of what you’re selling. For example if you sell homemade tea blends, it’s more than that. You’re selling peace with your chamomile blend or energy with your green tea blend. This is as important for the visual parts of your branding as it is for your purpose or mission. If you’re a yoga studio and you want to be seen as approachable, welcoming, and non-intimidating, then you want to be sure your logo has soft lines and round edges. Anything too sharp could come off as intense. Here are some keywords to get you thinking: honest, dependable, approachable, encouraging, helpful, imaginative, luxurious, elegant, analytical, witty. Does that help? 4. Who do you consider your competition? This could be anyone or any business that is making a consumer choose between you and them. I encourage you to think outside of the box on this one. I had a client who opened a hair salon specializing in custom hair color. When I asked her this question she said she considered her main competition to be the rising companies of in-the-mailbox color. These competitors have their consumers take an online survey and they mix hair color and send to you to dye your hair yourself. That is certainly competition! But maybe not one you would have thought of right off the bat. I also always google “hair salons near me” (or wherever your industry is) and research the top results. If that’s what comes up for you, then it’s coming up for your potential clients too. 5. What makes you different than your competition? This question ranks number two in importance after why you started a business. There needs to be a competitive advantage as to why someone would choose you. Let me give you a few examples. Costco is a membership only warehouse club that sells limited goods and they earned 129 billion dollars in revenue in 2007. Obviously limited goods isn’t their competitive advantage but it is in fact price. They sell goods at barely above cost and are able to do so because they make sales through a yearly membership fee. Consumers come to buy in bulk and take the discounted prices. Domino’s Pizza is a chain pizza delivery restaurant. Although I would hardly call it a restaurant as you can’t eat in their brick and mortar locations. Their competitive advantage is speed. They guarantee your pizza will be at your door within 30 minutes of calling. They even have trackers so you can watch your pizza’s location! Finally, let’s talk about Apple. The average household owns an average over over 2 Apple devices. That’s pretty insane. Their competitive advantage is quality and innovation. They continue to put out products that help improve your life, take amazing pictures, simplify phone calls etc. *A word of caution to the new business owner. If you are trying to figure out what your competitive advantage is please note that you cannot have the advantage of price, speed, & quality without failing or burning out. Of course your competitive advantage can be something completely different (i.e. you give free hugs with each purchase!) but keep that point in mind. If you give the best quality, that comes at a higher price tag. And if you are lowest in price then you’ll need to take on more work which sacrifices speed and/or quality. 6. What are your goals for the next 5 years? I know. Sounds like a typical interview question. But hear me out. It’s really important to think about what you might want to do with your company in the future. If you brand for today and not tomorrow, you’ll have to re-brand. Maybe multiple times. Say for example you are a wedding photographer but you have plans to learn more than just photography. You want to get into graphic design so you can do invitations too. If your logo was a picture of a camera and eventually you do more than that, it will become outdated. 7. How much does your product or service cost? This question should be pretty simple. When I say how much does it cost, I really mean what price tier are you in. Is your company considered a budget, average with the rest of the market, or premium/luxury. This will help you with your overall messaging, visual identity, and help determine what your ideal client looks like. If you’re not sure where you fit, research your competitors from question 4 and see how much they are charging for their products or services. 8. What are your concerns with the branding process? This could be anything that you are feeling. There is no right or wrong answer. It could be that you’re scared and honestly I think you’ll feel that a lot as a business owner, so that is a totally viable answer. I had a client that owned two Pilates studios that were in completely different locations with two very different demographics. Her concern was that her branding would appeal to one group but not the other. Having these concerns written out allows you to keep it in mind while you're creating your brand. This way you’ll remember to address it. 9. Who do you sell to? This is all about your ideal client. I want you to start to think about this one, but a full blog post is coming on this topic alone. We’re going to build your ideal client, so you can put them above your computer and always see them. This way your messaging is tailored to the clients you want to attract. Until then, feel free to email me if you have any questions throughout this process.